Hi there! 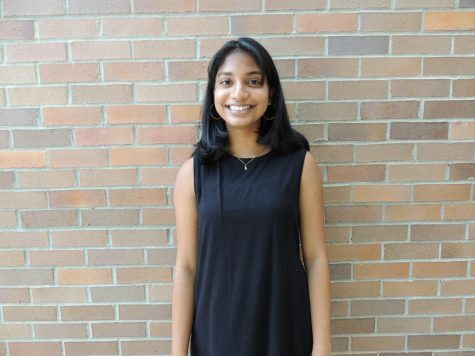 My name is Harsitha Kalaiarasan and this fall marks my second year on staff. Out of curiosity, I decided to gloss over my profile from last year and took a few moments to marvel at how inaccurately my words would describe me in the present. This reflection greatly comforts me, as I have come to know how effective a teacher change proves to be. I hope this year, along with myself, our award-winning publication continues to evolve and prosper. I truly rediscovered my love for writing as a first-year staffer. I loved the excitement and intensity of deadline week, and on bad days, how to rationalize my stress. There was- and still is- an enthusiasm within me for reporting the unheard and unnoticed. But I also take pleasure in the writing of less weighty things that characterize my community. Through hurricanes, shootings, politics, pep rallies, dances, football games, the significance of awareness emerged clear to me. Therein lies the importance of journalism: getting the facts out to the people, so they can be well informed global citizens with developed opinions (and hopefully empathy as well). Last year I entered as a staff writer. This year I am the feature chief, and in charge of determining the articles that will appear in my section, as well as the designing and formatting of said page in The Leaf. I also am an art/photo editor, available to aid in developing the package in anyway I can. Outside writing, I am a passionate tennis player, a yellow belt in Taekwondo, a (newly) avid reader, and a lover of the Spanish language. Tennis has been the biggest influence throughout my life, and has extensively molded my personality. One of my idols is Serena Williams, a strong competitor who has inspired me since childhood. As for reading, my taste lies mostly in classics; I am plowing through Jane Eyre as of the now and have Sherlock Holmes in sight for my next read. I love learning Spanish. Speaking the language has furthered my goals of studying abroad in a Spanish speaking country in hopes of becoming a fluent speaker. Thank you for stopping by to learn a little more about me, I am beyond excited to embark on the journey that is sure to be this year with all my fellow staffers.